At Chicago Charter Bus Company, we understand how stressful wedding planning can be. That’s why we strive to make it a little easier for you with streamlined, reliable group transportation. From minibuses to full-sized charter buses, we’ll find the perfect bus for you in our network of over 3,000 buses. Our reservation specialists are available 24/7 at 312-667-0906​ to speak about your big day! Don’t let long distances, expensive airfare, or missed flights be the reason why loved ones have to miss out on your wedding. You can rent a private charter bus to pick up out-of-town guests and bring them Chicago to participate in your special day. We’ll be your personal shuttle service on the day of your wedding. Don’t leave guests to navigate unfamiliar streets themselves, fight traffic, or find parking and risk late arrivals. Your shuttle service can pick guests up from their hotel and drop them off at your beautiful venue, like Loft on Lake. We know how hectic your wedding day can be. Focus on last minute details and let Chicago Charter Bus Company handle all your transportation on your big day. We’ll coordinate the transportation logistics and make sure you stay on track while you sit back, relax, and savor the special moment with your closest friends and new spouse. 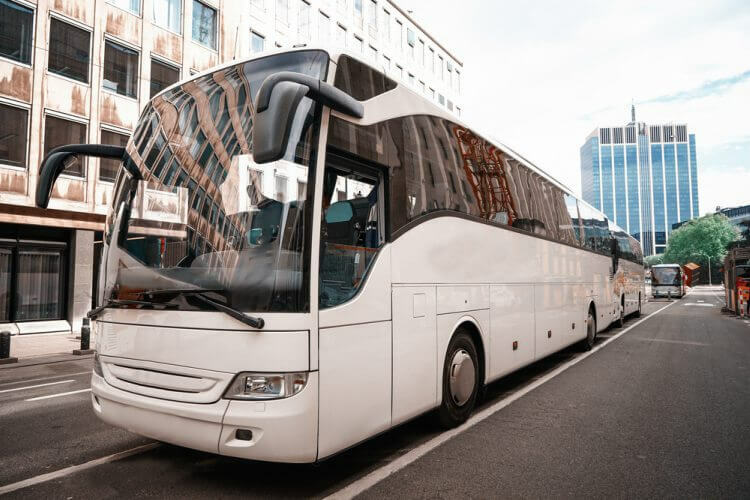 When you choose to work with Chicago Charter Bus Company, you’ll receive quality 24/7 customer service, modern bus rentals, and peace of mind. Your safety and satisfaction is our top priority. Call us any time at 312-667-0906​ to see how we can help you.